Dr Peter Sarkies explains how information hidden in the evolutionary history of life on Earth has helped illuminate new insights into gene regulation. Whilst this quotation certainly sounds impressive, it’s by no means obvious exactly what Dobzhansky meant, let alone how it helps explain why the study of evolution is important. To understand its significance, we need to look at the statement in a little more depth. 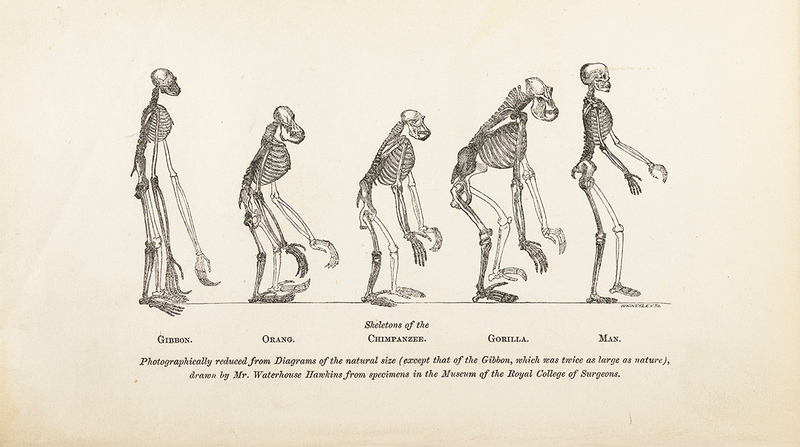 What do we mean by evolution? Dobzhansky was a noted evolutionary biologist, who had worked extensively on the process of species formation. His famous quote, however, comes from a pedagogic article that he wrote advancing arguments against creationists, who believe that all species alive today were put on Earth in their current form by a deity. 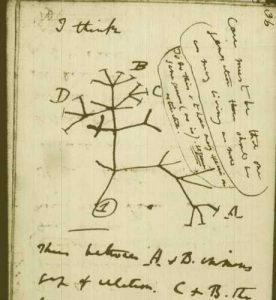 The point that Dobzhansky was making is that if we look at the features of different organisms we see abundant evidence for their common ancestry. As a molecular biologist, I find that the most striking examples of this are apparent when we look at the basic molecules of life: DNA, protein and RNA. All organisms alive today use similar mechanisms to make proteins – the molecules that do the main work in the cell. A genetic code specifies how triplets of chemical bases within DNA directly specify the amino acids in a protein (for example the sequence TTT in DNA codes for the amino acid tryptophan). The specific code relating DNA to protein is almost identical in all organisms alive today, from E. coli to human. There doesn’t seem to be any fundamental chemical reason why the code is so similar: instead the exact nature of the code is likely a consequence of the fact that all life on earth today is descended from one talented (or very lucky) species. Whilst the genetic code might represent a historical accident, the process of evolution through natural selection has shaped other features of the molecular biology of human cells. It is this principle that guides my approach to science. In my laboratory we are interested in the mechanisms of gene control. One of the pathways we’ve been studying is DNA methylation, whereby methyl groups are added to cytosines (one of the four chemical bases of DNA). The addition of methyl groups to cytosine can act as a ‘chemical flag’ to mark the DNA, a process that is essential for the development of the animal throughout life. 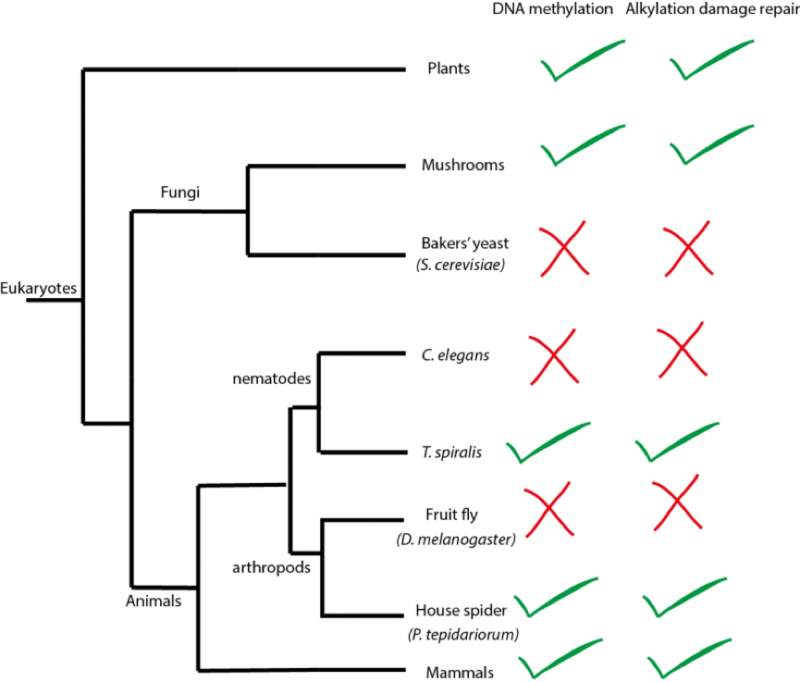 A simplified evolutionary tree showing some of the species of eukaryotes that the laboratory analysed. Whenever the DNA methylation system is present the DNA alkylation repair system is also present, indicating that the DNA methylation system might be the cause of the damage that the alkylation repair system usually repairs. Credit: Dr Peter Sarkies. DNA methylation can be traced back to the first eukaryotes, distinguished by the fact that they contain their DNA in a separate compartment called the nucleus. Curiously, despite its ancient origin and essential nature, DNA methylation has been lost in many organisms, such as fruit flies, nematode worms and yeast. To understand how this happens we thought about evolution by natural selection. If DNA methylation is lost in some organisms, are there other proteins that are lost at the same time? If so, knowing what these proteins are might help us to understand why DNA methylation is lost. Surprisingly we found that one such protein is a DNA repair enzyme called ALKB2. ALKB2 repairs DNA that has been damaged by the addition of methyl groups on the inside of the double helix which interferes with the pairing of the two DNA strands and is very dangerous as it prevents DNA from replicating, potentially resulting in cell death. 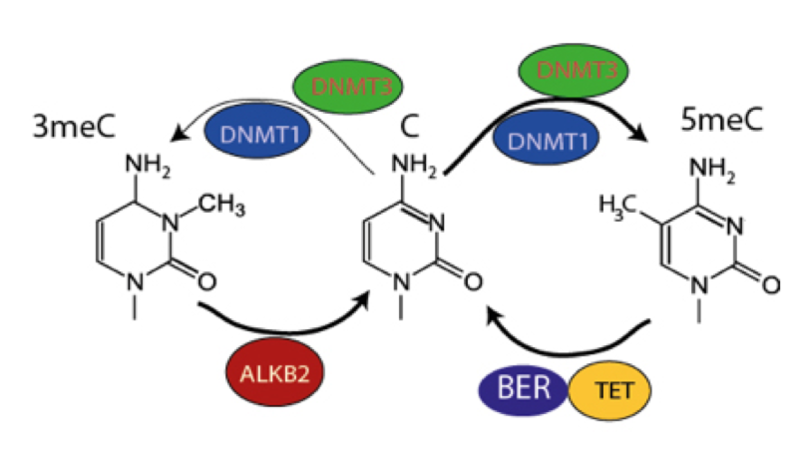 Finding that ALKB2 and DNA methylation coevolve led us to make a simple hypothesis – perhaps DNA methylation enzymes damage DNA and ALKB2 is thus present to repair it. We tested this idea in the lab with help from Petra Hajkova (also Imperial College London and MRC London Institute of Medical Sciences) with whom we developed a new method to measure the damaged DNA bases in cells. It turned out that DNA methylation enzymes do introduce DNA damage into the DNA at a low level, a previously unknown property of DNA methylation enzymes that we were able to uncover by studying their evolutionary history! This example shows that there is information hidden in the evolutionary history of life on Earth that can illuminate what happens in mammals today and, in this case, we think that our finding might have a relevant application towards understanding human disease. We think that the unexpectedly low level of DNA methylation occurring in cancer cells compared to the cells they originate from might have something to do with the dangerous DNA damaging property of DNA methylation, and this is one of the lines of investigation we are currently following in the lab. Returning to Dobzhansky’s quote, even if its original context has been forgotten, its message is still providing inspiration to my lab and many other research labs today. We’re hopeful that our philosophy of using evolution to try to gain insight into other gene regulatory pathways might provide us with further unexpected insights into what these pathways do and how they can be utilised with the ultimate goal to improve human health. Dr Peter Sarkies is a Senior Lecturer at Imperial College London and Head of Transgenerational Epigenetic Inheritance & Evolution at the MRC London Institute of Medical Sciences. The work in his laboratory is funded by the MRC. The group’s recent paper ‘Evolutionary analysis indicates that DNA alkylation damage is a byproduct of cytosine DNA methyltransferase activity’ was published in Nature Genetics.